Jerry Ballgame gives his thoughts on what the Red Sox might do in 2012. With apologies to the memory of Davey Jones, the time has passed when Red Sox fans could reasonably believe that post season play was a guaranteed right of Fall. 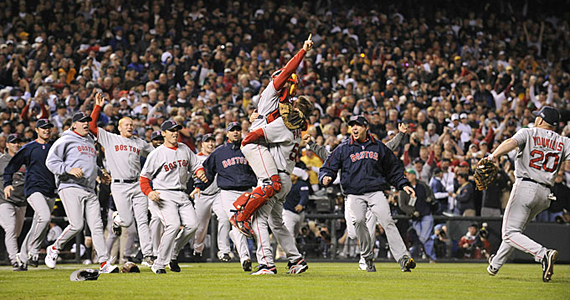 With the departures of Tito and Theo, plus the retirements of Wakefield and Varitek, and the crushing collapse of last September, there can be no question that the epic ride that started in 2004 has come to an official end. Although the 2012 edition of the BoSox has the makings of a competitive and entertaining team, there remain serious issues, most especially regarding the left side of their infield. Put that together with how difficult the AL has gotten, and you can understand why, even with the changes regarding the wild card, making the playoffs remains a significant challenge. Let’s address that infield situation first, shall we, as it’s clearly a major issue. Of all the weaknesses a baseball team can hide or compensate for, shortstop is not one of them. Lack of range or an erratic throwing arm can prolong innings, increase pitch counts, and just in general drive pitchers crazy. At this point, it’s beginning to look like the Sox are gambling on a very young José Iglesias making the jump to the big time. As they traded away their most experienced shortstop (Marco Scutaro) in an admitted salary dump, they have little choice. No one seems to be questioning Iglesias’ defensive skills, but his hitting is reportedly a year or two behind. Perhaps the Red Sox have enough confidence in the rest of their offense that they can risk the a hole in their lineup. More importantly, let’s hope he is ready from a maturity stand point. Many a “can’t miss” prospect has been permanently damaged when given too much pressure too soon. Speaking of the rest of their offense, Kevin Youklis has got to return to form. It’s been a few years since “Youk” was the force in the lineup that they need him to be. Another year of injuries and reduced fielding effectiveness, and you could see Youk on his way out; trade bait, as the saying goes. His rather emotional approach to the game is inspiring when he is producing, annoying when he is not. There are other questions, the answers to which will help shape the outcome of the 2012 season. One of the more obvious ones regards Carl Crawford and his cranky wrist, and big market make up. I’m hopeful and optimistic that he will step up this year and resemble the player he was in Tampa Bay. He may never live up to his contract, but just some extended periods of solid play, and aggressive base-running, would be a welcome sight. I like what the Sox did in regards to their right field need, by acquiring Ryan Sweeney and Cody Ross. My prediction is that Ross, who was signed for one year at $3 million, will be this season’s Adrian Beltre. He is likely to start the season in left field, as it’s looking like Crawford’s wrist isn’t going to be ready on time. I believe that the Sox are hopeful that Sweeney will also provide some power production from a position that was rather lacking in it last year. Probably the most obviously intriguing, and far and away the most important answers we seek lie with the pitching staff. Will Lester and Beckett shape up? Will Bard crack the starting rotation, or will Andrew Bailey’s early injury issues necessitate his return to the pen? Will Stamford’s own Bobby V.’s knowledge of Japanese baseball help him transform Dice-K into the $104 million man we were promised he’d be? Is Buchholz’s back going to survive a full season? Will Felix Doubront force his way into the starting rotation? Will Aceves continue his incredible versatility? Will he be the closer? 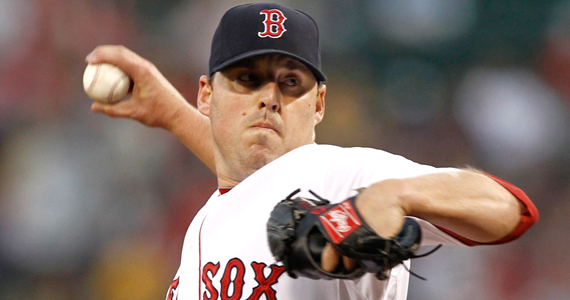 Will anyone miss John Lackey? Will they make another play for Oswalt? What will Papelbon use for his intro-song? (Did I go too far?) I think you get the idea. I’m actually optimistic that the answers to most of these questions will be in the positive, and will help the Red Sox be competitive. Also on the positive side of the ledger is the right side of the infield. Defensively, Pedroia and González are as good as they come. If both are healthy, and can stay that way, we will be guaranteed more than a few laser shows this Summer. I don’t think we can expect another power performance like last years from Jacoby Ellsbury, but he’s certainly established himself as a star who would be worth tying up for the future. The catching should be in good shape with Jarrod Saltalamacchia far more relaxed from the get-go. I’m not sure I’m crazy about the re-signing of David Ortiz. Despite impressive stats for the year, his production fell off dramatically in September. Add that together with his unseemly tirade aimed at Francona when he thought he’d lost an RBI, and you can understand why I’m wondering if bringing him back was such a wise move. The Sox do have their DH’s in waiting, with Ryan Lavarnway and Lars Anderson about ready to step in should Papi’s performance fall off. The youngsters could be key pawns in a trade, but I doubt the Sox would move either of them anytime soon. At this point, I am confident that Boston will field a competent and competitive team. I won’t be shocked, however, if the most entertaining thing to happen in Fenway Park this Summer is the return of Bruce Springsteen. Great post. You bring up some interesting points. Also I was cracking up at the paragraph with all the bullpen/rotation questions. Not sure if that was supposed to all be funny, or just a couple of them. But I’m a fan.